The end of last month witnessed the capture of Jawbar, Zamalka, Irbin, and Hirista suburbs in Damascus from the opposition to the Syrian regime , as the Turkish-backed Free Syrian Army captured the city of Afrin and most of the surrounding province from the Kurdish People's Protection Units and Syrian Democratic Forces . From here, the upcoming actions are almost predictable. The regime will move against the rebel enclave of Duma, the Turkish Free Syrian Army will target Manij. In each of these actions the promises of the Syrian revolution will fade even further from the promises and hopes of activists and demonstrators seven years ago, although the lessons will never be forgotten. From a population of some 17 million (2014), approximately half a million have been killed, and another five million have become international refugees. The map of Syria is being redrawn to suit the powers of other states. Once but a close ally, the Syrian government is now in reality entirely dependent on Russia and to an extent Iran. For their rebel-held areas of northern Syria, Idlib, and west Aleppo, they are increasingly under the control of Turkey, which now has observation posts deep in the region, including Surman, Tell Tuqan, Al Eis, Anak, and at the time this is being written Khan Shaykhun, and Chab Plain. The Kurdish People's Protection Units and the Syrian Democratic Forces are understandably nervous, following the possibility of a U.S. military withdrawal , an astoundingly weak move. Although Rojava does enjoy popular support throughout other democratic governments, and the possibility of other NATO powers stepping in is high; France has already made an announcement to that effect . The prospect of conflict between NATO powers should give Turkey cause for caution. There are, of course, numerous edge cases that can still prove to be disruptive. The Southern Front rebel forces in the Daraa Governorate have proven to be both steadfast against attempts to dislodge them and have remained an important democratic and secular alliance, true to the original Free Syrian Army. Daesh still controls some land around the Deir Ez Zor governate. Rebels have held an enclave south of Hama and north of Homs for a number of years. Within opposition controlled Idlib, there is still conflict between moderate and Islamicist forces, especially notable is the disparity between the military power of Hay'at Tahrir al-Sham and their lack of popular support. Whilst the future is not entirely written a high degree of predictive stability has been reached, making it opportune to review the critical events of the past seven years. The Syrian revolt did not come from without, despite the protestations of many of the regime's apologists. Rather it is grounded in the objective reality of people's experience, both political and economic. 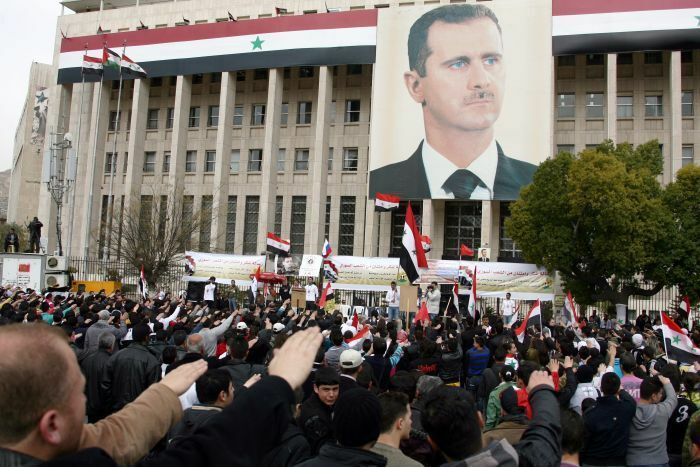 On the political level, it was the experience of the authoritarian dictatorship of the al-Assad family, which had ruled Syria through the fascist Arab Socialist Ba'ath Party since 1971 . The regime was largely controlled by the small Alawite minority, especially dominating the professional arm of the military. Politically, the al-Assad regime has never tolerated any effective opposition to its rule, consistently ranking as one of the least democratic countries worldwide, with the worst levels of media freedom, and the highest levels of corruption . Economic reasons cannot be overlooked either; following Hafez al-Assad policies in the last years of his rule, Bashar al-Assad accelerated privitisation and market programmes, which further increased inequality even if overall GDP per capita increased, with notable concerns over youth unemployment, water supply, and food prices. It is understandable that the initial revolts in 2011 occurred in the poorest cities and districts. The Syrian protests started when a dozen teenagers in Daraa were arrested and tortured for writing anti-government graffiti in March 2011 which occurred simultaneously with an outbreak of hunger strikes by political prisoners and Syrian Kurds  Major anti-government protests occurred in Ma1, primarily in Damascus, Baniyas, Homs, Hama, Aleppo, Daara, Al-Hasakah, and Deir ez-Zor, demanding democratic reforms and the release of political prisoners. These protests were often subject to police dispersions, and eventually live ammunition in many instances, killing hundreds of protesters, and then seiges of cities and suburbs. It was in this context that the Free Syrian Army was formed from defecting offices who refused to accept orders to fire on civilians . Soon afterwards, the FSA were allowed to establish a headquarters from within Turkey, and from a field operations centre in Syria they were able to carry out a number of successful raids, with large numbers of defections in 2012, leading to large parts of the country falling effectively under their control, despite concentrating on guerrilla warfare methods. Despite these successes, the FSA struggled to consolidate their successes, primarily due to a lack of finances, arms, and military experience. In this environment, the Islamicist al-Nusra front emerged with superiority in all these factors, and as a result was able to lure many former FSA rebels away . Armed conflict between the FSA and al-Nusra front became common during 2013 creating a three-way conflict. With neither the Free Syrian Army, the Syrian regime, or Al Nusra having sufficient strength to gain the upper hand, a new group arose in eastern Syria; Islamic State, resulting from a split in al-Nusra. Previously known as Jama'at al-Tawhid wal-Jihad (Organisation of Monotheism and Jihad), they previously had engaged in operations in western Iraq; in Syria they quickly became known for their reactionary religious fundamentalism, the quest for a worldwide caliphate, and application of a terrorist version of sharia law. Expelling the FSA from Raqqa, they were able to establish that city as their de-facto capital for operations in Syria, just as Mosul was being used for the same purposes in Iraq. Russia was always close to the Syrian regime, with an alliance dating back to the Cold War. As the location of their only Mediterranean naval base, it was predictable that Russia would support the Syrian regime, and did so with extensive arms contracts . What seems to have surprised the United States, was the degree that Russia would ignore the human rights abuses of the Syrian regime and indeed, how far they would aid and abet these actions. Thanks to Russian protection in the United Nations, the Syrian regime was able to engage in indiscriminate bombings in civilian areas, causing tens of thousands of casualties, with impunity. The effectiveness is not be understated; the Syrian regime was able to regain significantly territory held by the opposition, including Aleppo city in December 2016. Recently, Russia itself has also joined the use of unguided airstrikes in civilian areas, which constitutes a major war crime . Nevertheless, both Russia and the United States saw a combined concern and agreed on international action against Islamic State (aka Daesh). Whilst Russia worked with the Syrian regime to attack both Daesh-controlled and Syrian opposition-controlled territory. Russian targetting of the latter group has assisted the regime enormously. Whereas the United States (through Combined Joint Task Force – Operation Inherent Resolve) targetted almost Daesh positions, and has largely sided with the Syrian Democratic Forces (formed October 2015), a mainly Kurdish group but with notable support from Arabic, Assyrian, and Turkmen nationalities. The SDF was notably egalitarian, localised, and democratic , and have directed most of their military energy against Daesh and Al-Nusra Front. Following the lifting of the Siege of Kobanî in 2015 by Combined Joint Task Force – Operation Inherent Resolve support with Kurdish ground troops, Daesh were put on a significant and constant retreat. Whilst there was a partial and notable advance to capture Palmyra in 2016 (while regime and Russian forces concentrated on Aleppo), the SDF was capturing significant land around Raqqa and northern Deir ez-Zor (especially through French-led aerial support through Opération Chammal), and eventually would capture the city in 2017. In Iraq, Daesh would be expelled from Mosul in 2017. In 2016, Turkey engaged in a major military intervention, against both Daesh and the SDF, with a Free Syrian Army identified groups, in 'Operation Euphrates Shield', which would become known as the "Turkish-backed Free Syrian Army", capturing al-Bab. By late 2017 this would be the single largest and most cohesive group of that name in northern Syria, and would be would fight alongside Turkish forces in capturing Afrin and extending their influence Idlib province and west Aleppo. By the end of 2017, Daesh under attack by pretty much everyone else, was largely a spent force. Palmyra and Deir ez-Zor and west of Euphrates had been taken by the Syrian regime. The area east of the Euphrates was mainly in the hands of the Syrian Democratic Forces. The Syrian Observatory for Human Rights, which provides reports of sufficient accuracy to annoy partisan allegiances, claimed that the leader of Daesh, Abu Bakr al-Baghdadi, had been killed . At the time of writing, Daesh has been reduced to a few villages east of Palmyra, a strip of land along the Iraq border, and a few villages on the east side of the Euphrates, north of the Iraqi town of Al-Qa'im. It has been some five years since a general article on the situation on Syria has been written on the Isocracy Network website , although we have followed up with regular short updates, interviews with refugees, etc. At that time the size of the Islamicist groups were tiny, but effective, and there was cause for optimism that a democratic Free Syrian Army would prevail against the despotic Syrian Baathist regime. Nevertheless, it was also predicted that the longer the war continued, and the greater the likelihood of Islamicist growth. Even at that time it was recognised that "the Islamicists are a worse future than the fascist Ba'athist regime", and with unfortunate foresight, it was recognised that there was a need for democratic autonomy for the Kurdish regions and Latakia. The Isocracy Network was probably almost alone in the latter concern, however if the latter had been advocated more widely, Russian intervention to protect their most significant military interests would have been somewhat mollified. That did not happen of course, and Russian intervention completely changed the military and political landscape, even more than the conflict between the now Turkish Free Syrian Army and the Kurdish-dominant Syrian Democratic Forces. Turkey, the biggest supporter of the Free Syrian Army for their own ends, is also a major cause of the defeat of the revolution, but their own intransigent refusal to recognise the legitimate claims for Kurdish self-determination. It is arguable that one can count January 21, 2018 as the day when Free Syrian Army capitulated entirely to Turkey , and when the revolution lost any possibility of success. Staffan de Mistura, UN special envoy to Syria, has told the opposition forces bluntly "if they were planning to win the war, facts are proving that is not the case. So now it's time to win the peace" , and this is sound advice. Insofar that peace much come with justice however, this is not going to be a just peace, but rather an temporary end to war. The Assad regime, will remain in place with its leaders intact, instead of going to The Hague where they belong. For the people who live under the regime, they will have a temporary peace under one of the worst abusers of human rights in the world, and their day of reckoning must be deferred. For the Democratic Federation of Northern Syria, this must become quickly recognised as its own state from de-facto to international, especially by the democratic countries of the world. Whilst raised as a prospect, the idea of democratic Rojava being part of a future federal Syria ruled by the Assad dictatorship is implausible and should be avoided. For Idlib province, FSA defeat of the remaining Islamicist forces and occupation or even annexation by Turkey is the most likely palatable result, and likewise while it has largely stayed out of the conflict directly, the same can be said for Jordan and the opposition-controlled areas that it borders. Chances are, of course, that this will not happen, at least not around the negotiating table, but rather as a de-facto reality. Either way, the original promises of the Syrian revolution have been largely suppressed by actual events. Revolutions may be built on hope, but they also need real and tangible support. The Syrian revolution had plenty of the former, but not much of the latter. Whilst the regime did suffer military defections, the defections were not enough, and the revolutionaries remained underfunded, and increasingly so, even compared to the religious fanatics. Meanwhile Russia, and to a lesser extent Iran, were able to prop up the regime financially and militarily. Over time, the Free Syrian Army increasingly became reliant on Turkey, and thus preventing the most probable path to defeat both Daesh and the regime - a unity between the Free Syrian Army and the Syrian Democratic Forces. To the extent that did not happen is the extent that the Syrian revolution failed, a curious but explicable failure considering that both groups claimed that they wanted to change the regime and introduce democratic reforms. Freedom with justice for all Syrians is something that will never be extinguished in hope, but has now been deferred in reality for the immediate future. "Ba'athism may have been a Middle Eastern variant of fascism, even though Aflaq and other Ba'ath leaders criticized particular fascist ideas and practices... the attempt to synthesize radical, illiberal nationalism and non-Marxist socialism, a romantic, mythopoetic, and elitist 'revolutionary' vision, the desire both to create a 'new man' and to restore past greatness, a centralised authoritarian party divided into 'right-wing' and 'left-wing' factions and so forth; several close associates later admitted that Aflaq had been directly inspired by certain fascist and Nazi theorists." Syria: Thousands suffering neurotoxic symptoms treated in hospitals supported by MSF, Médecins Sans Frontières. 24 August 2013. Commenting on this Story will be automatically closed on June 8, 2018.